You may want to discuss with your students how this tropical rainforest, which is very short in stature and in which most of the trees are all of the same species, compares with other tropical rainforests. In addition, compare it with the mangrove swamp and arid zone that are just a few km (mi) away on this island. Although the lowlands of the Galápagos Islands are quite arid most years, the highlands of the larger islands get significant amounts of rainfall and mist. Some parts of the highlands on the island of Sta. Cruz are home to remarkable forests that are dominated by Scalesia pedunculata trees, which are members of the daisy family. Frequent and heavy mists help support large numbers of epiphytes (plants that grown on other plants), so these forests look very much like mainland cloud forests. 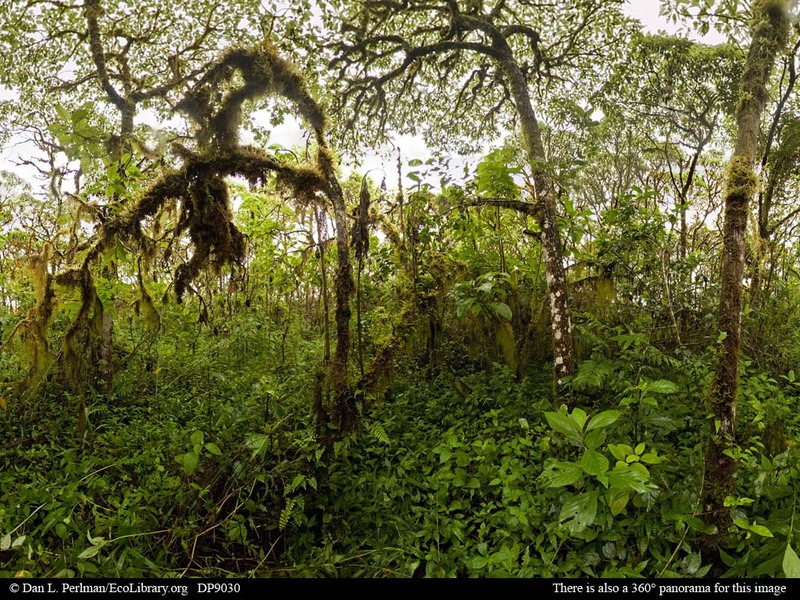 However, compared with mainland cloud forests, they are at lower elevations (only about 550m or 1800ft, which is about a third or less the elevation of cloud forests), much shorter (no more than 15-20m or about 50-70ft tall, less than half as tall as other cloud forests), and much less diverse due to the dominance of Scalesia trees (cloud forests frequently have dozens of tree species). Compare this panorama with the Mangrove and Arid Zone panoramas from the same island, as well as with other tropical rainforests.